Genelec is a Finnish firm that has been making professional studio monitor loudspeakers since 1978 and has been gaining solid ground in the U.S. recently. In fact, any one who spends much time in recording studios will instantly recognize the company’s 1030A powered monitor; this diminutive speaker has become a familiar sight atop recording consoles in facilities both large and small. Dimension ' 125" x 7.875" x 9.5" (HxWxD) Weight 15 lbs. Dimensions: 24.5" x 12 5" x 20" (HxWxD) Weight 66 lbs. Broadly speaking, a monitor loud speaker is any speaker that’s used to judge the quality of commercial-grade audio, from recordings to radio and TV broadcasts. But the term has additional implications: Because sound is a professional’s livelihood, and downtime is profitless time, a monitor’s reliability is of supreme importance. And because rock bands (which account for more than 90 of all studio time) demand “live” playback levels, studio monitors must be able to deliver deafening volume levels without folding up in the stretch. On the other hand, since re cording engineers and their clients tend to be both hearing-impaired (see “deafening” above) and oblivious to the subtleties of high-end audio, studio monitors tend to be singularly lacking in the very refinements that critical audiophiles demand. Thus, the term “monitor” can be a compliment or a pejorative de pending on who says it. The popularity of Genelec monitors here reflects a trend in professional circles toward “powered” speakers, that is, speakers with a power amplifier built directly into the speaker cabinet. Except for subwoofers, this trend has yet to trickle down to the consumer market, which is unfortunate. It turns out that speaker manufacturers may actually know more about what kind of amplifier best suits their speakers than any manufacturer of amplifiers. Unlike Home THX systems, where the front speakers are controlled-dispersion (narrow vertical, broad lateral) monopoles and the surrounds are fig ure-8 dipoles, the Genelec Home Theater System uses identical, wide- dispersion monopoles all the way ‘round. This means you can listen to them while seated or standing without any drastic change in the sound. (If you’re out of the vertical axis of a THX speaker the high end goes down the tube.) It’s still a good idea to tilt the speakers up or down toward ear height, but the angle is much less critical. The 1030A, which comprises 5/ of Genelec’s “basic” home-theater system, was originally designed as a near-field monitor for use in recording studios. (“Near field” means the speakers are placed close to the engineer’s ears, so he or she will hear only the direct sound from the speakers and not the reflected sound of the room they’re in.) In order to sound farther away than they actually are, near-field monitors usually have a less prominent midrange than floor-standing monitors, which often sound aggressively forward even from six feet away. Each 1030A is hi-amplified and has its own electronic crossover. The internal amplifiers are (of course) solid state, and judging by how cool they are after three hours of use, they aren’t Class A. They are shock-mounted to isolate them from vibrations of the speaker enclosure, and there are back-panel controls for tweeter level (most effective at the highest frequencies), bass tilt (including one boost setting), and bass rolloff, each in 2 dB steps. That may sound like a pretty coarse adjustment step, but in reality when something sounds whacked out, a small amount of adjustment is usually not what’s needed. You can make these speakers sound almost any way you want. You can also make them sound like hell if you’re not well acquainted with the sound of live music, so my advice is to leave all of them set to Flat unless you have an objective means of measuring what they’re doing in your room, such as a real-time frequency analyzer. After messing with all three controls for a few days early into my tests, I realized I’d ended up with them right where they started: at Flat. I never looked back. The 1030A’s metal dome tweeter is recessed in a shallow horn which, though symmetrical in appearance, is claimed to have different horizontal and vertical dispersion characteristics. A small label at the front indicates the proper orientation, and this is easily changed (if, for example, you need to put the center speaker on its side) by re moving four front-panel screws. Imaging is supposed to be at its best when the tweeter is properly oriented, but frankly, I couldn’t hear any difference. A Genelec engineer flew in to install the system, using a probe mike and a portable time-energy-frequency analyzer that looked much like the MLSSA system used by Stereophile to perform speaker measurements. ‘When he was done, the on-screen curve was impressive and so, initially, was the sound. The recommended way of setting the subwoofer phase was rather clever: You feed an 85 Hz (the crossover frequency) warble tone or pink-noise band to the system and switch the sub to 180 degrees, which is reverse polar- icy. This causes a dip in the level of the test tone. You then toggle the 90- degree switch on and off and note which setting increases the amount of the dip, indicating maximum cancellation at crossover. You leave it at that setting and flip off the 180 switch, which then yields maximum smoothness through the crossover region. Simple, and it works. Software included a handful 0 recent blockbuster laserdiscs, a DAT collection of soundtrack excerpts, some old and new stereo LPs, and some of Steven Stone’s and my live- performance DATs of symphonic and chamber-music works. Okay, how did the system sound? Everyone knows metal-dome tweeters sound awful, and I kept trying to hear the Genelecs messing up at the high end, but in all truthfulness, I couldn’t. In fact, the high end from the Genelecs stomped on every Home THX system I’ve heard. It was gorgeously smooth, detailed, and very open—all qualities that have been lacking from the THX systems I’ve reviewed. String tone—about which I am very picky because I hear so much of it live—was impressively real. All string instruments produce intense and highly complex overtones, and have a strikingly unique sonic signature that I have never heard reproduced well. For instance, loud massed violins usually glitter like polished steel, and are either muted and dull at the top or overlaid with hashy crud. The Genelecs were good enough that I could come home from a concert (or a recording session), listen to well—recorded strings, and convince myself that there was more than a passing similarity. The midrange was essentially free from any colorations, but was a little reticent for a professional monitor (these are near-field speakers, remember). They were, however, much less laid-back than many high-end speakers; musical timbres were only slightly darkened, which took some of the blat off big brass sounds and some of the aliveness from all sound, but most instruments were quite convincingly reproduced. These speakers are probably as good a compromise as I’ve heard between the intelligibility requirements of soundtracks and the euphonic “musicality” demanded by high-end audiophiles. The 1030As are ideal candidates for an all-in-one home entertainment system. They threw a very wide soundstage, with precise imaging and very good reproduction of depth. Resolution was between very good and excellent, which puts them right up there with the average high-end separates system. There were some imperfections, however. Although I never actually heard them overload, they tended to become rather hard and strained-sounding at high listening levels, and soundstage depth diminished notice ably. They did not handle really big sounds with the effortless ease of a THX system, and seemed to slightly compress dynamic range. Instead of getting goose bumps when the whole orchestra cut loose, I found myself tensing up. I can hear some readers saying, “Of course, he’s hearing those damned metal tweeters.” I don’t think so. I’ve heard the same high-level brightness from paper and plastic cones. And some of the smoothest, airiest, most effortless sounding tweeters I’ve heard were the Titanium ones in the JBL 250Ti system. My initial enthusiasm about the Genelec system’s bass started to wane in about a week. I don’t know whether the system changed or whether it just took me that long to hear a problem that was there all along, but that great low end I remembered from my first listen became intolerably heavy and loose, particularly at listening levels approaching the THX reference. Some recent laserdiscs were positively suffocating, and I found myself having the worst acoustic feedback problems from LP that I’ve encountered for many years. I’ll spare you the details of my efforts to tame it. Suffice it to say the best solution turned out to be rolling off the low end, which exacted a price in the deep bass while pretty much curbing the excess, but not entirely. There was also a slight and intractable hum from the 1030As when using the subwoofer’s built-in cross over with unbalanced inputs, apparent y due to a ground loop. (There are six interconnects between the surround decoder and the subwoofer module.) This was only audible from close to the speakers, but as soon as I noticed it, I kept thinking I heard it from the listening seat even if I didn’t. Driving the 1030As from the Lexicon’s crossover eliminated the hum. Although I applauded the coming of Home THX because consumer audio was sadly in need of some performance standards, I must confess that I’ve been disappointed with the THX sound I’ve heard to date. While all THX systems are likely to be better set up for home theater than their anarchistic brethren, and most of them have quite extraordinary naturalness and realism, no THX system I have heard has had anywhere near the suavity and resolution of a good run- of-the-mill high-end system. This may change when a recognized leader in high-end loudspeakers signs on to the program, but meanwhile, I spend my THX listening admiring what it does well and suffocating at the lack of any real hear-right-into-the-group inner detail and upper-octave openness. The Genelec home-theater system has more of both these things than any THX system I’ve heard. But the subwoofer is definitely its weakest link. 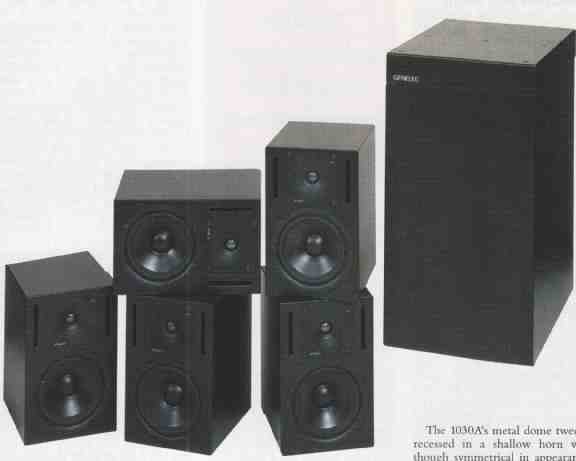 As I said, this might be because I only used one, but the fact is, the bass had a tendency to billow when pushed hard, and did little more at other times than add some impressively deep and rumbly foundation to the system’s far superior upper range. Unlike most home-theater satellite speakers, the 1030A is actually de signed for full-range use. It can handle the full range of bass frequencies at its rated output without risk of damage or overload, and its range extends to a respectable 50 Hz when it isn’t being crossed-over to a sub. (This sounds a lot deeper than you might imagine!) For this reason, the speaker is an ideal starting point for building toward a full surround system in easier-to-afford increments. You can add one, then two surrounds to a stereo pair, and finally a center if your listening area is wide. The subwoofer is a last option, but I’d suggest trying a pair of them before passing judgment on one. You may do better with Genelec’s larger subs, or a pair from another manufacturer. Incidentally, I got a chuckle out of the Genelec’s slogan, aimed of course at recording engineers: “Your business is audio--don’t play with toys.” To which I might add, “If you’re serious about your hobby, don’t skimp on loudspeakers.” The Genelec home-theater system may be one of the easiest ways to buy into a full-blown surround system, but it sure doesn’t sound cheap. Aside from my reservations about the subwoofer, this is a system that excels on music as well as film soundtracks. Recommended, but at what level? By home-theater standards, I’d rate these as definitely middle B. By high- end audio standards, a low B or, more likely, high C.
The little Genelec impressed me from the get go with the neutrality of its Sound. I was not surprised, therefore, when I measured its on axis response to find that it was basically flat, though a slight excess of energy (1 dB) could be seen in she low treble (This tends to r veal problems in a recording -- a useful thing in a studio monitor) There was a hint that the midrange was slightly shelved down, which would tie in with JGH auditioning comments The I 030A's bass is surprisingly extended for such a small speak an The near field measurement indicated that it remains flat down to lust below 60 Hz, below which it drops like a stone to prevent the woofer from bottoming out. (The bass alignment appears to be 6th-order, something that is relatively easy to achieve with an active design.) The Genelecs horizontal dispersion was wide and quite evenly balanced, correlating with the good imaging, though there was a slight lack of off axis energy at the top of the woofer's passband compared with the tweeter Vertically, you should sit with your ears pretty much on the tweeter axis to avoid a hollow coloration due so a lack of energy in the crossover region. I didn't find the tweeter's dispersion to be significantly different in the two planes. The speaker isn't time-coherent: the tweeter is connected with inverted acoustic polarity, the woofer with positive polarity and the tweeter's output arrives at the ear before that of the woofer, thought not to any audibly significant extent The associated cumulative spectral-decay or "waterfall plot" showed a very clean initial decay, with just a bit of low-level hash present in the low treble. The cabinet proved to be reasonably free from panel resonances, though all surfaces vibrated relatively strongly at the port tuning frequency of 60 Hz. The side panels also had a couple of nodes present between 350 Hz and 450 Hz. These are probably too high in frequency to be the cause of any midrange coloration, however.